Hatteras has the geographical good fortune to be located closer to the Gulf Stream than any point in the US north of Stuart, Florida. Cape Hatteras also marks the area where the last of the waters of the cool Labrador Current collides with the warm waters of the Gulf Stream as it begins its eastward turn toward Europe. What this does is to provide us with fish from both directions and, as the seasons change, the species of fish change. Depending on the time of year you are likely to encounter outstanding fishing for many different types of fish. We have variety and we have quality! Hatteras dolphin (mahi-mahi) fishing is probably the best dolphin fishing to be found anywhere! From Mid-April though late October they are caught with high regularity. The best of the action is from early May when the gaffers (any dolphin which needs to be gaffed in order to boat it) ranging up to 50 plus lbs. appear and plentiful through early October when they become less willing to school up and also become more boat shy. Large dolphin will probably be encountered on any trip taken out of Hatteras during this time frame. However, they are much more common in May and June. From early June onward we have lots and lots of school dolphin with most fish ranging from 2 to 5 lbs. We are limited to 60 fish per boat per day and most boats catch their limit on a very regular basis. Dolphin is the most versatile table fare of any fish I know. It can be cooked in many different ways and freezes better than any other fish we catch. Yellowfin are caught here year round. Our best months are March, April, May, November and December when they seem to bite more readily. In the summer months we encounter them on virtually every trip but the bite is inconsistent – i.e. some days you catch them and some days you do not. There is a limit of three fish per person and in the spring and fall that limit is often reached. Everybody loves a Wahoo! Twenty pounders are the norm but there are a lot of 30 lbs plus fish caught. They are present all year round with mid-July through September probably being the most consistent time to catch them. Usually they are solitary travelers and more than two or three on any given day is considered to be quite good. The have firm white flesh and are exceptional table fare. I consider them to have the most dramatic coloration of any fish when they first emerge from the water. THEY ARE ALSO THE MOST DANGEROUS FISH WE CATCH, WITH MORE INJURIES SUSTAINED FROM THEIR RAZOR-SHARP TEETH THAN ALL OTHER FISH INFLICTED INJURIES COMBINED. The fastest fish in the ocean!!! Blue marlin are THE prize big-game fish caught off Hatteras, for no other fish has such a combination of size, speed and spectacular leaping ability. Blue marlin are special! This is basically a catch-and-release fish because only large ones (greater than 99 in. lower jaw fork length (LJFL) or approx. 400 lbs.) can be legally boated. Coupled with the fact that almost all large marlins are female it is exceedingly rare to see one brought to the docks these days. Catching a blue marlin is a bit like hunting that big buck – you do not get him on every hunt. They have been caught here literally every month of the year, however, the best of our fishing is during the summer months with May, June and July being our most consistent times. 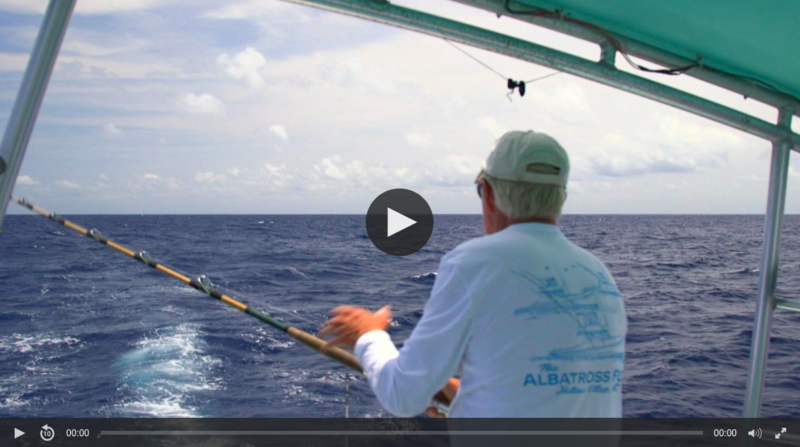 These are the acrobats of the billfish world. With most fish weighing between 40 to 60 lbs. they can be caught on relatively light tackle and are great sport. Almost all are released and the minimum size that can be boated is 66 in. LJFL. We typically catch them from April thru October with the best month in Hatteras normally being July. Recent years have seen catches drop significantly, a fact that is causing great concern for all of us who fish. However, recently we have seen a big rebound in the white marlin population. Our best sailfishing is usually in July, August and September. Again, this is a catch-and-release fish with a minimum size limit of 57 in. LJFL. They are great fighters and I have always found it interesting that they tend to be in the same places as wahoo. They certainly add excitement to our late summer action. The past several years have seen record numbers of sailfish. The favorite fish of my wife. We catch them year round with some excellent winter fishing. We have a spring run of kings, summer kings and our fall smoker kings. For serious king mackerel fishing it is the fall fishing that is good. Beginning in October and running through mid-December the big kings show up in numbers. Using live baits we consistently catch 30 lbs. plus fish with some fish above 50 lbs. The use of live baits with very light tackle fished close to the boat results is numerous leaping strikes and a high level of angler involvement. It may be heresy, but I find smoked king mackerel to be better table fare than smoked salmon. In recent years they have made a remarkable comeback. Blackfins are now a regular part of our daily catch. Most are 5-10 pounds and can range up to 40 pounds. Most of the largest ones are caught while live-bait fishing for King Mackerel in the Fall. Pound for pound they are the strongest tuna. This is our top inshore fish. From mid-May through early October they can be counted on if you troll along the beach or in the mouth of our inlet. Great table fare, they are also excellent marlin baits. With a 15 fish per person bag limit they provide a lot of fun and great eating for any number of anglers. The second staple of our inshore fishing. Ranging form ¾ pounds in the springtime to 3 pounds by September these fish provide great inshore trolling action, especially if you find a school that is in a feeding a frenzy. I like them fried fresh out of the water but they do not keep well. Recently I have tried smoking them and find that they taste great and keep well if properly smoked. The Rodney Dangerfield of the offshore world. Lets see — big, strong, fights hard, easy to handle around the boat, holds still for a picture and can be eaten. Amberjacks provide all this while getting no respect. These guys are found around all of our wrecks and, interestingly, have changed their habits down through the years so that we no longer catch them with surface trolled baits (forty years ago hundreds were caught with surface trolling techniques only). We catch them all summer long. We catch bonito throughout our fishing season. Although they are mediocre table fare they are the cut bait of choice for dolphin fishing. You should expect that any bonito caught will be claimed by the boat for future charters. Remember, the bonito you use today was caught by someone else yesterday. What a confusing name. The atlantic spotted bonito is an oily fish with an awful taste. They are not longfin albacore. They are pretty, fight hard for their size and make good strip baits and cut bait. They tend to be most plentiful in the spring and fall and are caught year round. We get cobia most often as an incidental catch. They range from the edge of the Gulf Stream to the channels leading to our inlets from the sound. They are caught by sight casting to individuals or small groups of fish on the oceanside or by using cut bait while at anchor in the inlet or the sound. Occasionally we come across a turtle that has a small school of cobia trailing it and these fish can sometimes be caught by casting a jig to them. A 30 pounder is a nice one and a fifty pounder is big. The biggest prize of our inshore fishing. Our best fishing seasons are April/May and mid-October thru mid- December. A school of 30 to 50 pound channel bass on a sunny day with clear water and calm seas that allow for sight casting is as fine an angling experience as you could want. Old Drum, as they are locally called, was until recently the only fish that never, ever, was wasted by islanders. Served in a dish that included boiled fish, boiled potatoes, fried pieces of salt pork and chopped raw onions, each prepared separately and mixed together for the first time on your plate with plenty of pepper and salt and lots of the grease from the salt pork, this was a meal to die for. (Forget the visuals, just trust me.) There was no other fish that any islander would drive 10 miles to get their hands on. Those where the good old days! Anything over 27 in. is now illegal to keep so the above recipe is out. They are only eaten poached these days. If it is long and lean, smells a lot, and has a really dramatic set of teeth you have just caught one of our barracuda. Present from early summer on, they are most common during the warmest summer months, especially around wrecks. With a mouth that is truly impressive they are not nearly as dangerous as the previously mentioned wahoo. We have sharks. I guess the shark populations are in trouble, but not here. Our all-round fishing is so good that we almost never target them and they are caught incidentally. Makos in the springtime eat our tuna, hammerheads are seen on virtually every trip and if you are unlucky, your live baits (and especially any cut bait) get mauled while you try to live bait king mackerel. We have some excellent bottom fishing. The most readily available fish are black sea bass, triggerfish, various snappers, grouper and tilefish. Most of the fishing is along the edge of the continental shelf and is subject to the currents of the Gulf Stream. What this means is that some days conditions are right for bottom fishing and some days the strong currents makes it quite difficult. This information is offered only as a general guide because the migration of certain species occurs for reasons I do not fully understand. It is the mystery of fishing more than anything else, which still excites me as much as ever after many seasons of trying to catch them. The following is based on my observations at Hatteras since 1958.